The New York Philharmonic makes CONTACT! at MoMA. 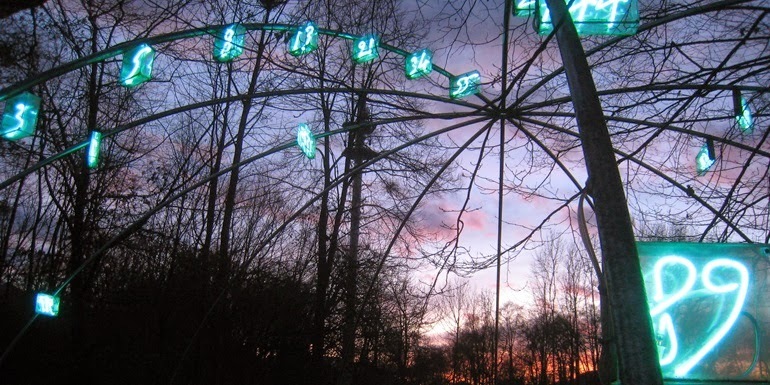 The Mario Merz sculpture Ziffer im Wald inspired a work on this week's CONTACT! program at the 2014 NY PHIL BIENNIAL. Photo from salzburg.gv.at. In the Alan Gilbert era at the New York Philharmonic, the CONTACT! series has provided a playground for musicians and enthusiasts of modern music alike to hear avant-garde compositions n a more intimate venue than the vast cavern of Avery Fisher Hall. On Thursday night, composer/conductor Matthias Pintscher led members of the orchestra in Beyond Recall, a late-night new music marathon at the Museum of Modern Art. This was the first of three CONTACT! concerts in the orchestra's ongoing NY PHIL BIENNIAL. Lauren Snouffer in Gloria: A Pig Tale at the Metropolitan Museum of Art. 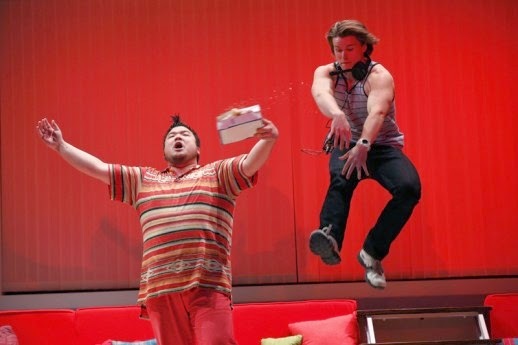 Opera is a serious art. Unless its perpetrator is H.K. Gruber, the imaginative Austrian composer whose Gloria--A Pig Tale is the second new stage work to have its New York premiere in the early days of the first NY PHIL BIENNIAL. 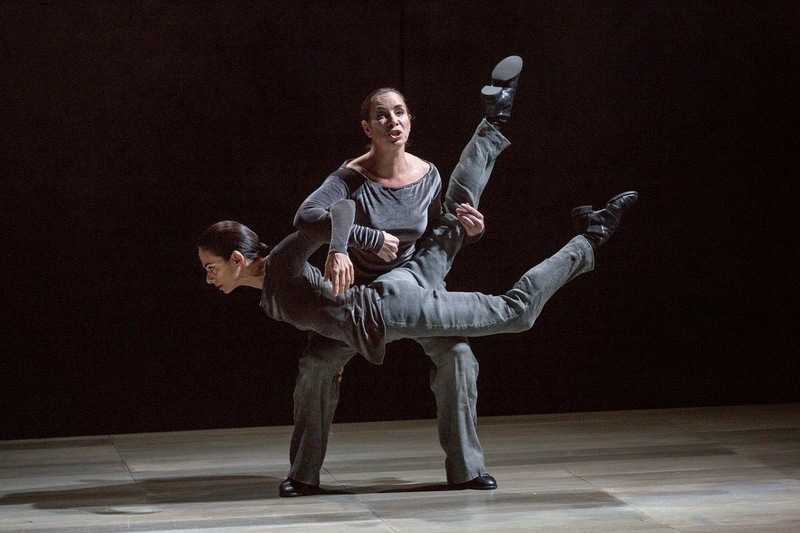 This new production was a collaboration between New York Philharmonic music director Alan Gilbert, director Doug Fitch and AXIOM, a Juilliard-based ensemble devoting itself to the interpretation of contemporary music. Opera Review: Bird or Fiend? 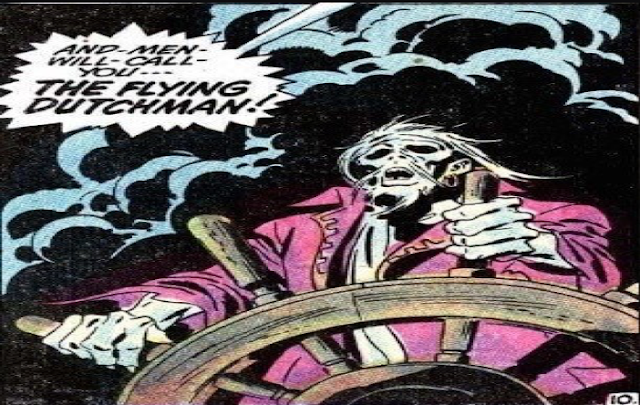 Gotham Chamber Opera opens The Raven. Singer Frederika Brillembourg (standing) and dancer Alexandra Ferri in The Raven. Photo by Richard Termine © 2014 Gotham Chamber Opera/NY PHIL BIENNIAL. 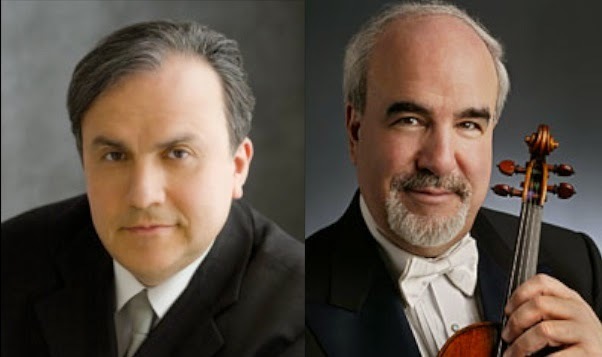 Members of the Philharmonic at the 92nd St. Y.
and Concertmaster of the New York Philharmonic this season. Portrait photos © 2014 The New York Philharmonic. The giant sound of a major symphony orchestra often obscures the excellence of its component players. Last Friday night at the 92nd St. Y, members of the New York Philharmonic joined pianist (and current Philharmonic artist-in-residence) Yefim Bronfman for an evening of chamber music, highlighting the excellent individual voices that comprise New York's oldest orchestra. All of New York's new music under one big umbrella. 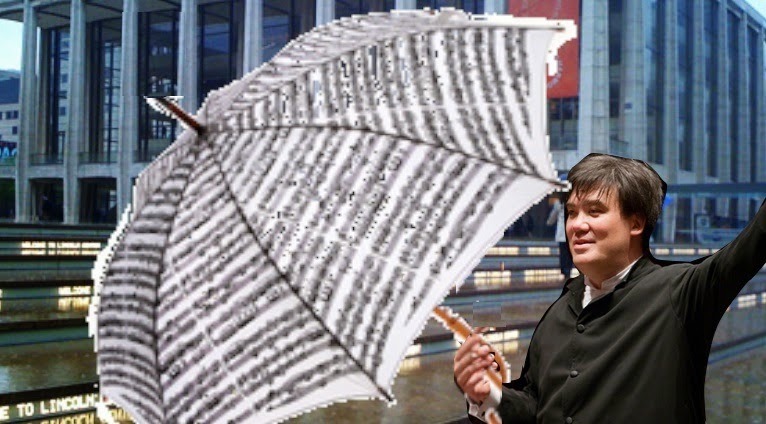 Alan Gilbert and an umbrella welcomes you to the NYPHIL BIENNIAL! Original photo of Alan Gilbert © Chris Lee, photo alteration by the author. For music to survive, a new audience must be created. That's part of the philosophy behind the New York Philharmonic's first ever BIENNIAL, a festival which engulfs New York in the music of the late 20th and 21st centuries. A collaboration with the Gotham Chamber Opera, Orchestra of St. Luke's, SubCulture, the American Composer's Orchestra and both the Metropolitan Museum of Art and the Museum of Modern Art, the NY Phil Biennial will push the musical envelope while hopefully introducing a new generation of composers to interested listeners. 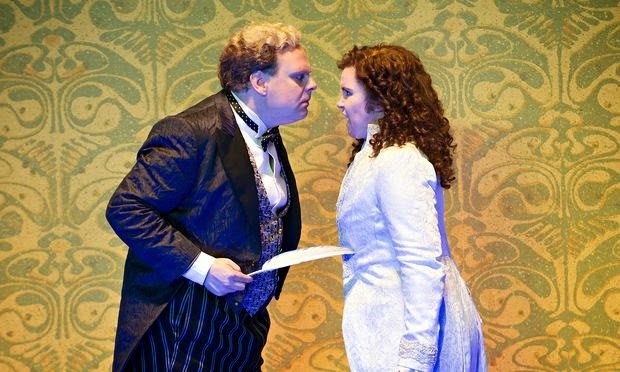 A few words on the Glyndebourne Rosenkavalier controversy. Der Rosenkavalier at the 2014 Glyndebourne Festival. Photo by Tristram Kenton © 2014 Glyndebourne Festival. There's been a lot of Internet space occupied lately by the controversy following reviews of the new Glyndebourne production of Der Rosenkavalier. 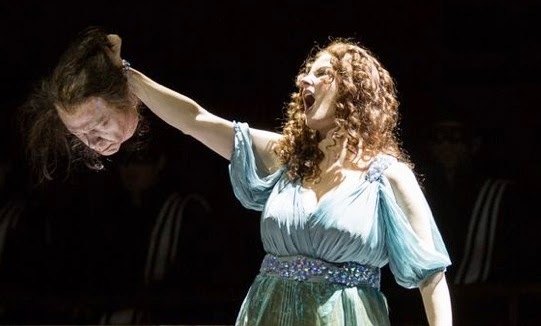 Last week, British critics from major newspapers (including The Times, The Daily Telegraph and the Financial Times) took mezzo-soprano Tara Erraught to task for her body type in the performance of the opera's titular role. The controversy has since jumped the Atlantic and received coverage from the Washington Post and the New York Times website. Vladimir Jurowski makes his New York Philharmonic debut. 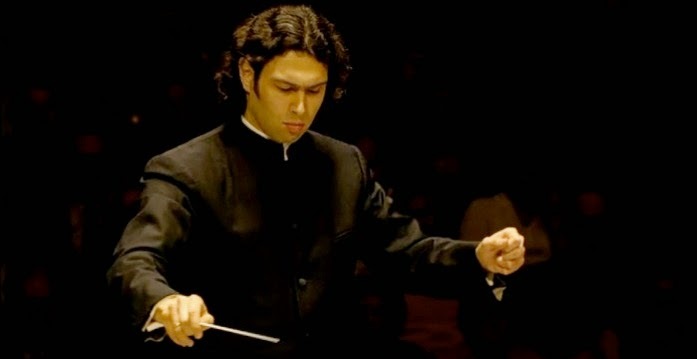 The conductor Vladimir Jurowski made his New York Philharmonic debut this week. With his long dark hair, spidery limbs and penchant for conducting in priestly vestments, Vladimir Jurowski strikes a dashing figure on the podium. In his New York Philharmonic subscription debut (seen at Avery Fisher Hall on Thursday night) the Moscow-born conductor also proved that he is a budding master of 20th century post-Romantic repertory. The program featured Karol Szymanowski's Violin Concerto No. 1 and a set of excerpts from the 1945 Prokofiev ballet Cinderella. A Reflection, on Wagner's Birthday. 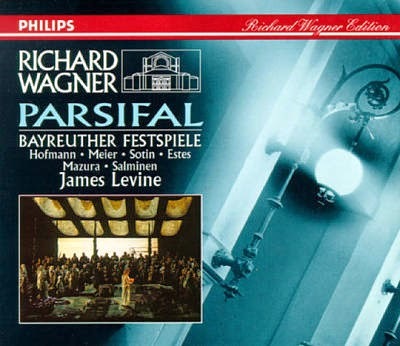 The Parsifal that started it all. Inset photograph © 1985 Bayreuth Festspiele. It all started with what I wanted for Christmas in 1993. "Mom, I want the Richard Wagner Edition of Parsifal with James Levine conducting." "OK." Mom was happy that my classes at Fordham (including The Age of Beethoven and Wagner and Wagnerism the year before had led to such a fruitful musical interest in her only son." The Oratorio Society of New York presents the St. Matthew Passion. Johann Sebastian Bach’s St. Matthew Passion is the composer’s mightiest creation, an unflinching account of the arrest, trial,and execution of Jesus as laid down in the first Gospel of the New Testament. First performed for Good Friday service in St. Thomas’ Church in Leipzig, it retains all of its emotional impact in the concert hall. 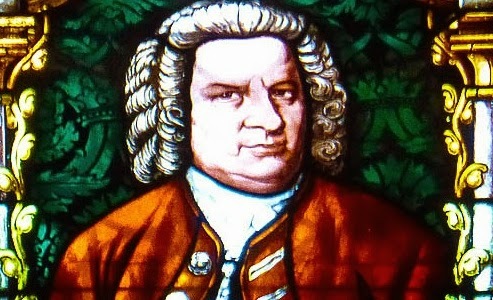 A strong performance of this work is a declaration of faith, not necessarily in Christianity but in the perfect musical design that Bach uses throughout this sprawling work. The Bavarian Radio Symphony Orchestra at Carnegie Hall. David Bowman (Keir Dullea) listens to music by György Ligeti. This week's Sunday matinee concert at Carnegie Hall was the last formal program of the spring 2014 season at the historic venue. 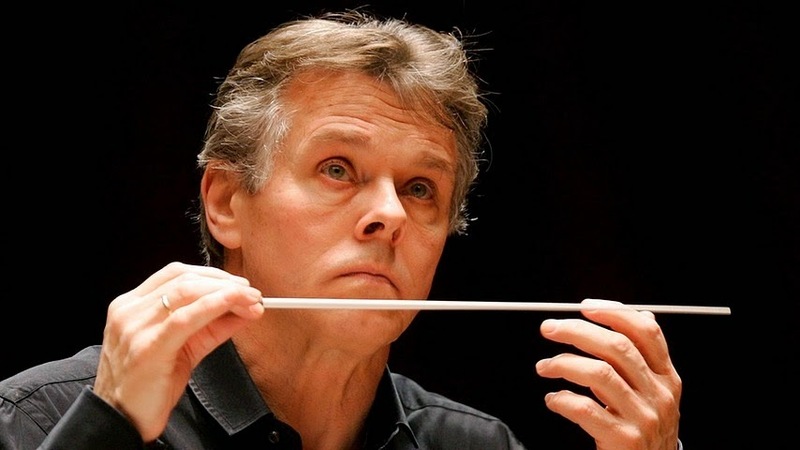 The last of three consecutive concerts featuring the Bavarian Radio Symphony Orchestra under the baton of Mariss Jansons, it was also something of an experiment: examining the development of modern music in central Europe by moving steadily backwards in time. 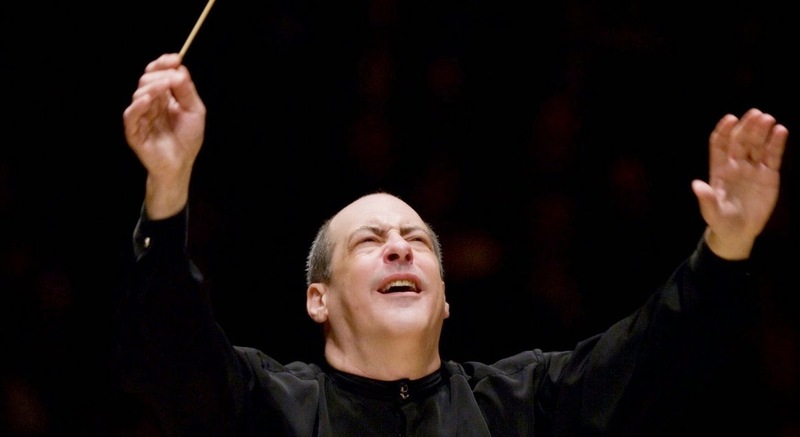 Bernard Haitink conducts Mahler's Symphony No. 3. At 100 minutes and six movements, Gustav Mahler's Symphony No. 3 in D Minor is the largest and longest symphony in the standard repertory. 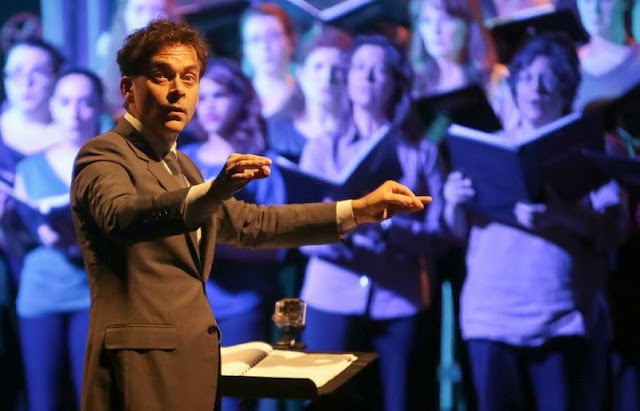 With the aid of two choirs, offstage instruments and an alto soloist, the work attempts to depict creation itself, moving through a vast cosmology from the mountains erupting out of the earth to the all-but-unfathomable love of a higher being. The Bavarian Radio Symphony Orchestra returns to Carnegie Hall. Bavarian Radio Symphony Orchestra back to Carnegie Hall this week. Photo from the orchestra's official site, © 2014 Bavarian Radio Symphony Orchestra. Although the concert season at Carnegie Hall is breathing its last, Friday night marked the return of one of Germany's greatest orchestras to that historic venue. This was the first of three performances this week featuring the Bavarian Radio Symphony Orchestra under the baton of Mariss Jansons. The program featured concert hall standard by Richard Strauss and Hector Berlioz, preceded by the first Carnegie Hall premiere of John Adams' 1996 work Slonimsky's Earbox. battle hymns on the U.S.S. Intrepid. Eyes in the back of his head: conductor James Bagwell. Photo by Erin Baiano © 2014 The Collegiate Chorale. For the first New York performance of David Lang's 2009 choral work battle hymns the Collegiate Chorale chose an absolutely unique venue: the hangar deck of the U.S.S. Intrepid. The retired aircraft carrier, moored on the Hudson River and serving as New York's own Sea Air and Space Museum may not seem like an ideal choice for a mostly a capella choral work, but with some clever sound engineering and the leadership of conductor James Bagwell, the performance proved to be a successful one. The New York Philharmonic Acquires Two Met Principal Players. Metropolitan Opera to join the New York Philharmonic. Photoshop by the author. 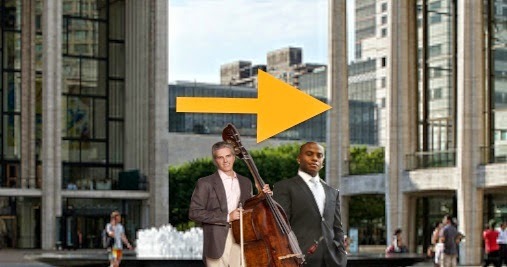 Two principal musicians of the Metropolitan Opera's orchestra are leaving the opera company and crossing Lincoln Center Plaza to join the New York Philharmonic. The New York Philharmonic announced yesterday that clarinetist Anthony McGill and bassist Timothy Cobb have accepted principal positions with their orchestra, filling two important and vacant positions with the historic ensemble. The defection of Mr. McGill and Mr. Cobb comes as union talks between the Metropolitan Opera and the members of its orchestra are heating up. The best of the Metropolitan Opera season 2013-2014.
and Joyce DiDonato in La Cenerentola. 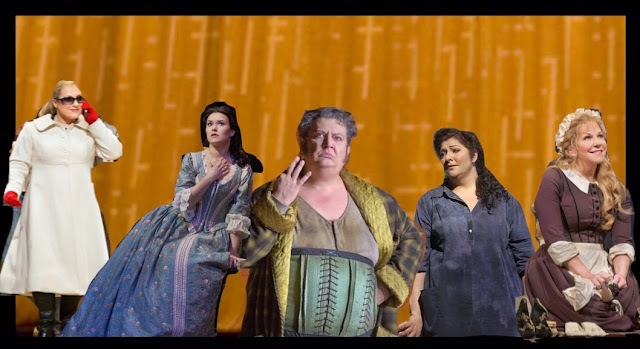 All images © 2014 The Metropolitan Opera. Curtain photo by Jonathan Tischler. Photoshop by the author. With the 2013-2014 Metropolitan Opera season in the books it's time to go over the very best (and worst) of an uneven year at North America's largest opera house. The MET Orchestra ends their season at Carnegie Hall. 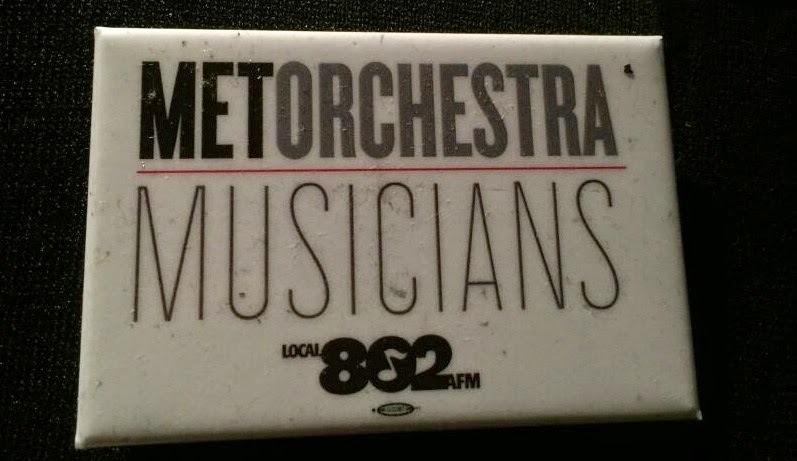 One of the "Local 802" badges from Sunday's concert. One year ago, the MET Orchestra's season-ending Carnegie Hall concert became the biggest story of the spring season. That concert, which marked the return of James Levine to conducting duties showed the players of the Metropolitan Opera's orchestra turning a corner and sounding inspired after a lackluster year spent without their music director. This Sunday's matinee concert was an all-Dvořák affair, just one day after the orchestra played two season-ending shows at the Metropolitan Opera House. It's a big story for a very different reason. Bernard Haitink returns to the New York Philharmonic. 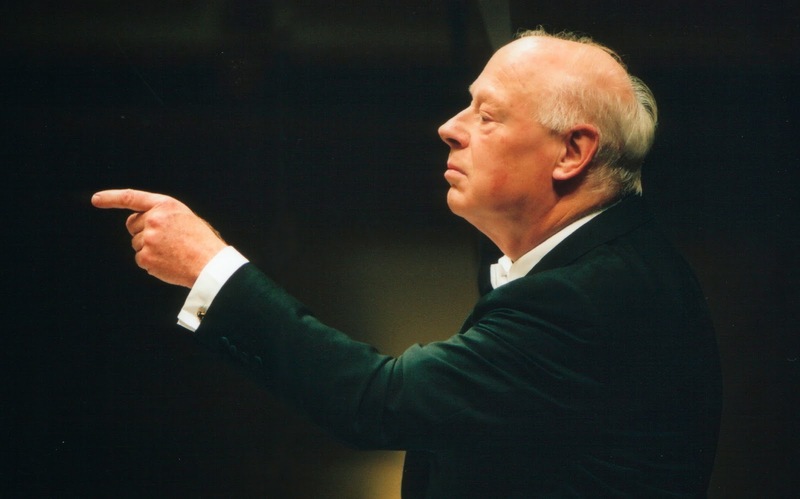 Bernard Haitink celebrates 60 years on the podium this season. 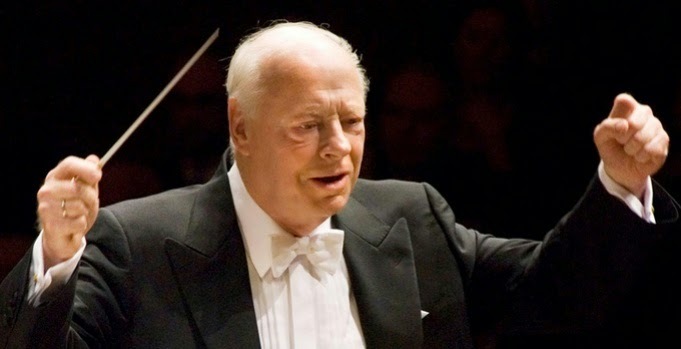 The New York Philharmonic celebrates Bernard Haitink's sixtieth year as an orchestra conductor this month, inviting the 85-year old Dutch maestro to Avery Fisher Hall for two weeks of concerts. On Saturday night, Mr. Haitink capped the first of his two concert programs with a program divided neatly between the Second Viennese School and Ludwig van Beethoven. The Cincinnatti Symphony Orchestra and May Festival Chorus at Spring For Music. Photo by Dan Steinberg © 2013 Los Angeles Opera. 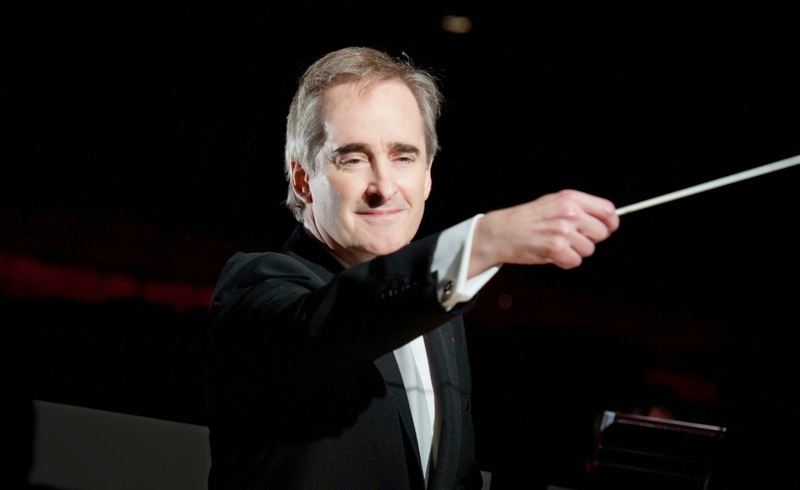 The conductor James Conlon has a reputation for making fearless choices when it comes to repertory. On Friday night, Mr. Conlon brought the Cincinnatti Symphony Orchestra and the May Festival Chorus to Carnegie Hall for the fifth and penultimate installment of this year's Spring for Music festival. The program was bold and innovative: pairing John Adams' tripartite choral work Harmonium with The Ordering of Moses, an oratorio by composer R. Nathaniel Dett. The Philadelphia Orchestra and Opera Philadelphia team up for Salome. In a year celebrating the 150th birthday of Richard Strauss, the most exciting concert event of the spring season was the premiere last night of Salome in Philadelphia. Strauss' opera was presented in a new semi-stage production by Kevin Newbury. 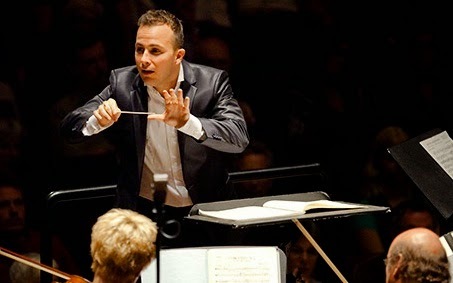 This was a first-time collaboration between Opera Philadelphia, the Philadelphia Orchestra, and the Orchestra's music director Yannick Nézet-Séguin. With an imaginative staging and an all-star cast, this was a riveting performance that explored this blood-drenched opera in great and sometimes uncomfortable depths. Merry Mount at Spring For Music. 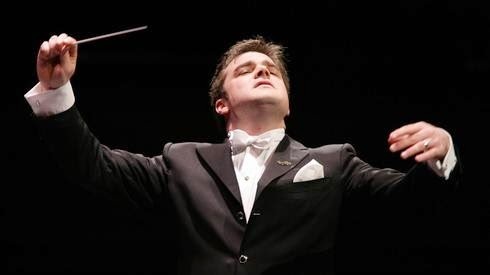 Conductor Michael Christie made his Carnegie Hall debut with Merry Mount. Howard Hanson's Merry Mount belongs to that large category of operas that were beloved upon their premiere but were quickly forgotten following its opening run. It premiered at the Metropolitan Opera in 1934, receiving a still-standing record of 50 curtain calls on opening night. On Wednesday night, the Rochester Philharmonic Orchestra brought this bold and ultimately fascinating work to Carnegie Hall as their offering for Night Three of this year's Spring For Music Festival. The results were...incendiary. The Seattle Symphony plays Spring for Music. 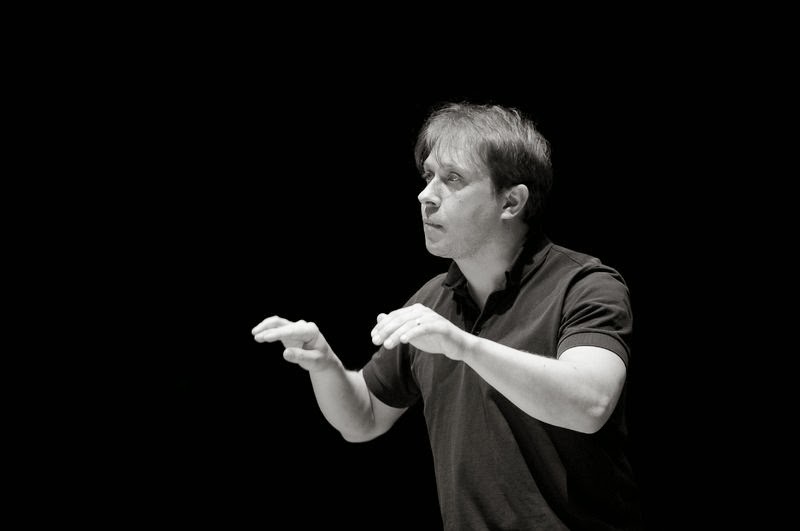 Conductor Ludovic Morlot in rehearsal. On Tuesday night, the fourth and final Spring For Music festival--that week-long celebration of of North American orchestras at Carnegie Hall with a dedicated focus on modern and obscure repertory--welcomed the Seattle Symphony for a rare New York appearance. The concert, under the baton of Seattle music director Ludovic Morlot featured the New York premiere of Become Ocean, the work that won the 2014 Pulitzer Prize in Music for its composer John Luther Adams. Christopher Rouse's Requiem opens Spring for Music. 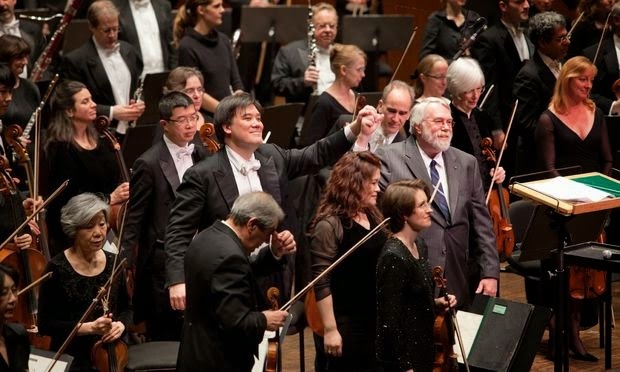 Alan Gilbert and Christopher Rouse (with hands raised) surrounded by the New York Philharmonic. Ever since Wolfgang Amadeus Mozart went to his grave without finishing his setting of the Mass for the Dead, the composition of a Requiem has been considered the crowning achievement of a career in composition. For Christopher Rouse, the first New York performance of his Requiem (at Monday's opening night concert of this year's Spring For Music festival at Carnegie Hall) is such an achievement: a culminating feat for one of America's most important modern composers. As a model for his setting of the Requiem text, Mr. Rouse chose the Grande Messe des Morts by his hero Hector Berlioz as his model. There are some parallels between the two works. Mr. Rouse chose Berlioz' edition of the text, eliminating sections like the Libera Me and opting for heavy orchestration with an awful lot of percussion. However, he also drew inspiration from Benjamin Britten's War Requiem, interleaving poetry in three different languages (mostly sung by a solo baritone) against the inexorable ritual of the Latin text. Here, the multi-lingual approach underlines the finality and universality of death, a grim message for this dark new century. MSM presents Haydn's Orlando Paladino. Loco del calor: Kidon Choi (left) and Cameron Johnson in Orlando Paladino. Photo © 2014 Manhattan School of Music. It's not always easy to make opera appeal to contemporary audiences. When that opera is Haydn's 1782 opera Orlando Paladino, a court opera written for the private theater of Prince Esterhazy and based on an Italian epic poem that premiered in the year 1513, the task is doubly difficult. Happily, the Manhattan School of Music and director Robin Guarino have closed out their season with this bold, innovative production that explored the increasingly blurred line between the packaged insanity of so-called "reality" television and the terrifying reality of actual insanity. Yannick Nézet-Séguin conducts Barber, Bartók and Bruckner. On Friday night, the Philadelphians closed out this year's Carnegie Hall series with a concert featuring music by the "other" three B's: Samuel Barber, Béla Bartók and Anton Bruckner. These three very different compositions formed an effective tryptich, giving indications at the state of the orchestra, as music director Yannick Nézet-Séguin wraps up his second season at the controls. 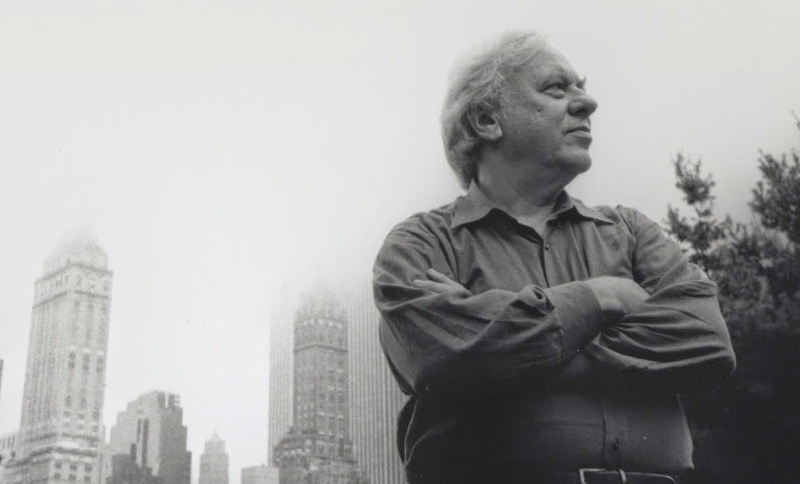 Richard Goode returns to Carnegie Hall. The Pierre, the Sherry Netherland and pianist Richard Goode in Central Park. Photo by Michael Wilson © 2014 Intermusica. Richard Goode stands outside the mainstream of contemporary concert pianists. His intellectual, sometimes cool approach to repertory, penchant for sight-reading in recital preference for the slightly shorter six-foot Steinway "music hall" piano over the standard eight-foot Model D make any concert of his a unique experience. Happily, as proved on Thursday night at Carnegie Hall, that experience continues to be rewarding. Or...life imitates baseball at the opera...or something. 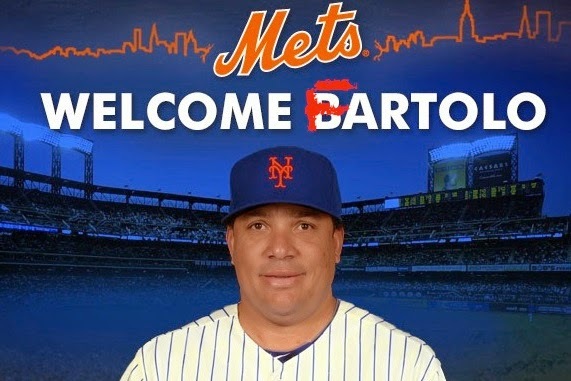 Photo © 2014 New York Mets Baseball Club. Property of Major League Baseball. Those who have seen Giaochino Rossini's opera The Barber of Seville know (and probably love) the finale of Act I where Count Almaviva, pretending to be a drunk (and very aggressive) soldier attempts to secure soldier's lodgings in the home of Doctor Bartolo, the cranky old attorney who is the villain of the show. In fact it is just another of the Count's ploys to woo Rosina, the young ingenue who is the focus of both men's efforts to win her hand in marriage. The Atlanta Symphony Orchestra plays the War Requiem. Last night's performance of Benjamin Britten's War Requiem by the Atlanta Symphony Orchestra and Chorus under music director Robert Spano will be remembered--not for the superb caliber of the well-prepared chorus, orchestra and soloists, and not for the power and sweep of Banjamin Britten's largest choral work. Rather, will be remembered because once again, a phone went off at a crucial moment. The offending electronic device chose to make itself heard at the worst possible time, ringing brassily in the middle of the Libera Me, the climactic and final section of the Requiem. In this work (written for the consecration of Coventry Cathedral in 1961) Britten combined the text of the Latin Mass for the Dead with the poetry of World War I veteran Wilfred Owen. Tenor and baritone share a duet, in the role of two soldiers meeting on the battlefield--with one of them speaking from beyond the grave. The phone rang in pregnant pause that comes at the end of the baritone's aria, and just before the voices join in the descending phrase "Let us sleep now," echoing the Requesciat in pace that concludes the work. Mr. Spano, to his credit stood stock still, putting one hand on the rail of his conductor's rostrum to indicate the work would not continue until the device was silenced. It was, and the work finished. The sounding of the phone did not eclipse the performance that had gone before. Indeed the Atlanta orchestra and more importantly, its famous chorus were in absolutely top form. Mr. Spano took a slow, measured approach to the opening movement that only increased its sense of funereal dread. When the forces switched (Britten set the poems to be accompanied not by the full orchestra but by a chamber-sized mini-orchestra located close to the conductor) the effect was both thrilling and transparent. A third ensemble: the Brooklyn Youth Chorus and a portative organ, provided scope to Britten's vision and a reminder that war's cost is not restricted to the battlefield. The chugging intensity of the Dies Irae was interrupted again by the Owen poems, reflecting and echoing the ideas that were expressed in the Latin text. Tenor Thomas Cooley, a late substitute for the indisposed Anthony Dean Griffey, proved an able singer, with a sweet, rounded tone that turned earnest when placed under pressure. This was particularly noticeable in the Agnus Dei where his account of the Crucifixion carried great emotional weight. The Liber scriptus brought soprano Evelina Dobračeva to the fore. Her searing instrument was one of the most impressive aspects of this performance, riding over the choppy waves of chorus and orchestration and staying gloriously on course. Ms. Dobračeva's performance in the latter movements enlivened and empowered choral passages of this work, providing a very human plea against the massed judgment of God in the Libera Me. Baritone Stephen Powell was not a substitute, but he proved less than ideal for his part. Britten specified a German singer for this role to underline the resolution of conflict between opposite sides of the war, but he tried to color his phrases with a slightly Germanic diction. This meant that some of his text came across as unintelligible, forcing the audience to follow closely with their librettos. His account of the un-dead soldier in the last movement was searing and close to the bone. It would have been better if the phone hadn't gone off.